Just three months ago everyone was happy. 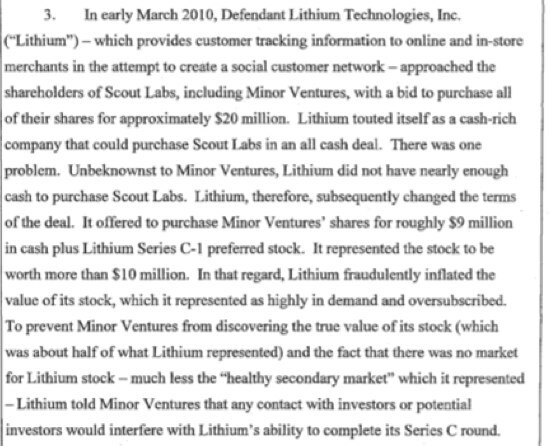 Lithium Technologies, which has a suite of social CRM solutions, picked up Scout Labs for a reported (by us) $20 million. Minor Ventures, which incubated Scout Labs, was able to take a nice, if small, liquidity event. Things aren’t so happy now. The entire amount at stake is around $5.5 million (half of the promised $11 million or so in stock received). Minor Ventures is also asking for punitive damages as well. We’ve embedded the full complaint below. 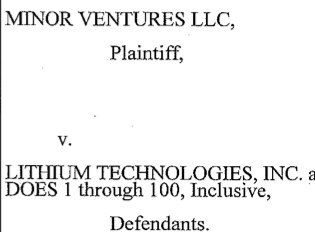 We’ve reached out to Lithium Technologies for their side of the story and will update with any comments.